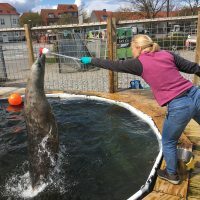 Kirstin Anderson Hansen is currently a Postdoc at the University of Southern Denmark and in cooperation with the University of Veterinary Medicine Hannover, where she trains grey seals and aquatic birds, currently cormorants and penguins to investigate the effects of underwater noise on marine life. She started her career at the University of California in Santa Cruz over 25 years ago, working with cetaceans as a research assistant and trainer. Later, she followed some of the dolphins to the Shedd Aquarium in Chicago, where she worked and trained Pacific White-sided dolphins, Beluga whales, harbor seals, sea otters, and penguins. 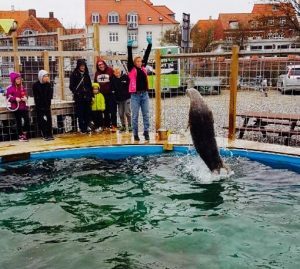 In 1998, she was offered a trainer position at the Fjord and Baelt in Denmark, training harbor porpoises and harbor seals for research and public demonstrations. From 2003 to 2013, she was the training coordinator and zoological curator at Odense Zoo, where she had the opportunity to expand her training experience to all types of animals, including lions, tigers, giraffes, tapirs, birds, and manatees. Kirstin is the Co-Chair for the Training Committee at the Danish Association for Zoos and Aquariums (DAZA), as well as the Assistant Chair for the Animal Training Working Group at the European Association of Zoos and Aquariums (EAZA), where she is also an instructor for the animal training and management courses for both DAZA and EAZA. In IMATA, she is the regional report coordinator for IMATA. CLICK HERE for a list of up and coming EAZA courses. CLICK HERE for the Marine Animal behavior and Bioacoustics FB page. 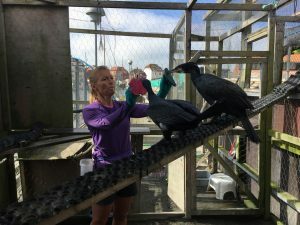 CLICK HERE for Kirstin’s study on the hearing ability of great cormorants.